Tropical Living, Hawaiian-Style Home. 1 Mile from Kona Town. The Hula Hut is really much more than a hut. 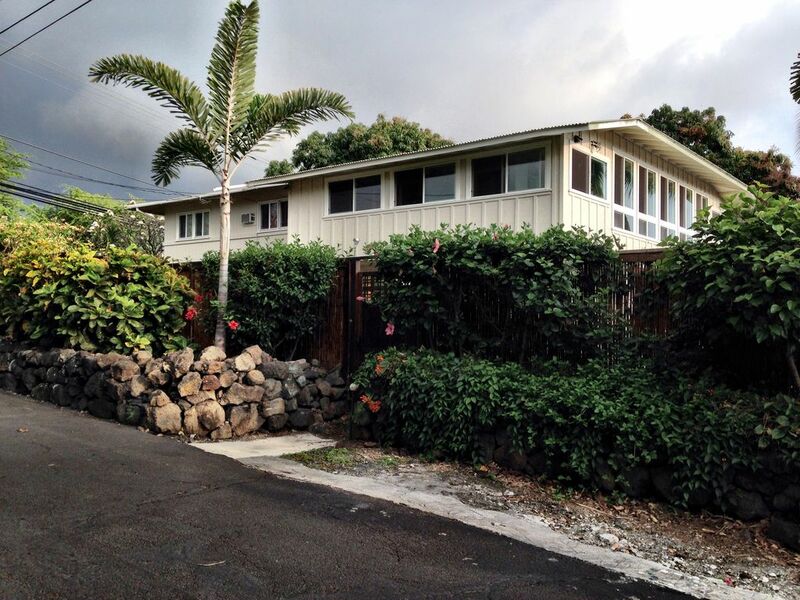 It's a private, 3 bedroom, 2 bath home located exactly 1-mile south of Kailua-Kona town. Decorated in a fun, relaxed, island-style funkiness, this home comfortably accommodates up to 6 people in a tropical living style. It's an easy walk to town where you can enjoy your morning coffee or a sunset cocktail at Huggo's on the Rocks or shop at the open-air farmer's market in downtown Kona. Enjoy the spectacular sunsets or explore the many tidepools on the lava shelf landing at the end of our private street. Commercial dive boats are often spotted here, rumor has it that some of the best diving on the island is right here! Relax by your own private pool and swim with the turtles! Take in the ocean view while lounging on the large lanai, cooled by the trade breezes. The house is situated on one level, has 3 bedrooms, each with a Queen-sized bed and air-conditioning, and a full-size futon on the expansive wrap-around lanai (complete with beautiful ocean view!,) 2 bathrooms, each with a tub-shower. Hardwood floors throughout and ceiling fans in the common living spaces. High Speed wireless internet access. Fully equipped kitchen, linens provided. Pick your own mangos for your breakfast or a tropical cocktail, from our 2 Huge Hayden mango trees. The perfect place to watch your tri-athlete run by! The house is well-equipped - great kitchen, lots of towels, beautiful pool, close to the water. It was centrally located and walking distance to downtown Kona. We had a lovely stay! Wonderful location, and charming home with Island motif. Tom W.Where do you live? Sunsets from the end of the street are a must every evening. Didn’t see the green flash, but had fun watching for it. The house was clean and nice to stay in. It is in a great location. The contacts we had were very helpful. The gardens and pool were wonderful. I enjoyed sitting out by the pool immensely. The house itself could use a little TLC. Some cupboard doors wouldn't close, the laundry door was not working and it made doing laundry very annoying as it would shut while you were trying to load and unload etc. Overall, the house filled our needs and we had a great time. Thank you for your review. I am sorry that you were unhappy with the cupboard door in the kitchen and the laundry door not staying open. We normally place a laundry basket in front of the door to prevent it from closing inadvertently. We are working our way through the house, upgrading as time and funds permit. I think our very low rates reflect that. A Great Family Vacation Rental! Our adult family of 6 stayed in Kona over Christmas. The location is great, with much beautiful secenery in the neighbourhood, but we do recommend having access to a car - Ali’i is quite busy and the shoulders a little narrow for walking. We loved having access to the beach at the end of our little street, though; the sunsets were spectacular! We greatly enjoyed the house, yard and especially the beautiful pool area! The house itself is very spacious, with a well-equipped kitchen and plenty of places to sit and lounge. We made many day trips around the island, cooked at home lots and enjoyed the local food and drink establishments. If you go, make sure to take a trip to the Kalapana lava flow - it was a huge highlight for us! Mahalo and aloha, Hula Hut! Enjoy the spectacular sunsets or explore the many tide pools on the lava shelf landing at the end of our private street. Commercial dive boats are often spotted here, rumor has it that some of the best SCUBA diving on the island is right here! Relax by your own private pool and swim with the turtles! Take in the ocean view while lounging on the large lanai, cooled by the trade breezes. The house is situated on one level, has 3 bedrooms, each with a Queen-sized bed and air-conditioning, and a full-size futon on the expansive wrap-around lanai (complete with beautiful ocean view! ), 2 bathrooms, each with a tub-shower. Hardwood floors throughout and ceiling fans in the common living spaces. High Speed wireless internet access. Fully equipped kitchen, linens provided. Pick your own mangoes for your breakfast or a tropical cocktail, from our 2 huge Hayden mango trees. The perfect place to watch your triathlete run by!